Do you wish you could look bigger? Do you wonder how you can build stronger muscles? Are you tempted to find out the exercises that could help you sculpt a V-shaped torso? Do you feel stagnant, like you've hit a plateau, and you're ready to change your looks? Are you terrified of ending up old, having wasted years of your life unsatisfied? If you keep doing what you’ve always done, you’ll never fight the blues and achieve a chiseled upper body. Look Bigger and Better: Get Big Arms Now, Sculpt A V-Shaped Torso, Look Better Instantly For Men, The Ultimate No-Weight Workout teaches you every step, including an action plan for bodybuilding. This is an audiobook of action and doesn’t just tell you to try harder. Life rewards those who take matters into their own hands, and this audiobook is where to start. Look Bigger and Better is full of real-life methods, proven techniques that have worked for many people for people just like you. These methods are backed by countless studies, all of which will arm you with a mindset primed for success, fitness, and proven ways to make men more attractive. You will learn small, easy-to-implement changes and practical takeaways for immediate action. Find out how to let go of your lack of energy and take flight towards being happy, period. Create a happy life and excitement you want. 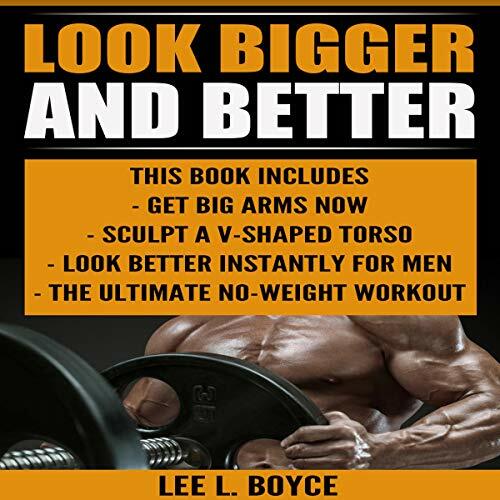 Listen to Look Bigger and Better: Get Big Arms Now, Sculpt A V-Shaped Torso, Look Better Instantly For Men, The Ultimate No-Weight Workout today. You’ll be on your way to getting happy within 24 hours. This is one book that is right for the drug-free bodybuilder, the guy who would overtrain if he attempted to do any the steroid-inspired workout routines found in muscle magazines. If you want to grow within the limitations nature puts on you or just to get into great shape, this is a book that will help you. I'm about halfway through this book and may find it my favorite among the best of strength building books. So far it is technical as to strength building training techniques but without an overload of technical physiology. The book reveals all the essential exercises that work the entire body, with clear instruction on their performance. There is a fascinating section on nutrition, and cardio training and fat loss are simplified too. All of that, coupled with sections on stretching, rest and recuperation, complete . . . the lifestyle. An extremely informative and well written book. An extremely informative and well-written book. A very logical common sense approach to weight lifting. The information on technique, equipment, nutrition and most of all on how to structure a workout have been extremely helpful for me. Someone who knows what he's talking about and is willing to explain it extensively. For young and old alike. My new workout bible. I can very highly recommend this book to anyone who's interested in reaching one's highest potential regarding both strength and muscles. Great book. Tell you exactly how to reach your strength goals safely! Excellent book! Highly recommended. This book cuts through the B.S. in the strength and muscle-building world and tells it like it is. The sections on how to select exercises, how to put together a workout, and what exercises are appropriate to substitute out if you have an injury are particularly helpful. Very good, no-nonsense nutritional guidelines, too. It's impossible for me to write a review that would truly sum up the genius of this book, the staggering training wisdom that it contains or the nostalgia that reading it set off inside of me. I think that this is a great book for anyone who is looking for intelligent guidelines that will help them to reach a new level of size and strength, or anyone who would like to know more "behind the scenes" information about the Hardgainer years. Excellent resource book. I purchased this book so that I could find what's the best workout for me. Lee knows how to get big arms, sculpt a v shaped torso and look better right and safely. There's also many tips about safety workout. I love working out, and everything about them. I just want to look better and bigger as much as possible. Everyone should try this audio book and be one of us. It's a very helpful guide. I have learned a lot from this book and I highly recommend it. I will definitely have more from Lee Boyce. Great experience to have listened to this kind of amazing and awesome audio book. Very helpful! I found this audible book very informative and comprehensive of having helpful and awesome content that perfectly suits to those who want to get big arms and look better. This is really an awesome audio book I have ever listened discussing how one can look better instantly. Liked this Audio Book due to its content that is full of great knowledge about workout.